Combine a Rearing Horse, a Big Damn Heroes rescue, some Cool Guns or a sword, a pinch of Dramatic Wind, and you get Horseback Heroism. The sight of "Lightning" rising up on his hind legs while thunder cracks in the background is enough to tell everyone involved that the Day is well and truly Saved. This is an old trope, though this hero is by no means riding a "dead horse" when he uses it to rescue friends or lovers. It's just that awesome. Updated versions may substitute a Cool Bike or Cool Car for the horse. In which case you can expect My Horse Is a Motorbike. Not to be confused with The Cavalry, who only sometimes ride literal horses. Sakaki did this in a dream sequence in the Azumanga Daioh anime. In Revolutionary Girl Utena, Akio swoops in on horseback in the nick of time to save Utena when she falls off of another horse. Of course, given that he's systematically working on molding Utena to fit the classic "princess" role, it's strongly implied that he orchestrated the whole thing so she would further associate him with her childhood prince. Batman does it in The Dark Knight Returns after a nuclear EMP strike knocks out all motor vehicle transport. In Sherwood, Texas #5, Loxley escapes an ambush in the stables and emerges on a charging horse; riding over one of the Nobles as he charges off to rescue Maria. Spoofed mercilessly with Prince Charming. Also parodied, then played straight in the climax, with Shrek and his "noble steed" (actually Donkey transformed into a horse). The climax of Sleeping Beauty is a battle with the mounted Prince Philip up against Maleficent to save Princess Aurora. Woody riding out on Bullseye to get Jessie off the plane in Toy Story 2. Kristoff riding Sven in Frozen. Sven is a huge reindeer but he is treated much like a horse in this way. Olaf: There's your act of love right there! Riding across the fjords like a valiant, pungent reindeer king! Jesse does this for the heroine of one of Joan Wilder's romance novels in the fantasy sequence at the start of Romancing the Stone. In Kate & Leopold, Leo rides down a purse snatcher through Central Park on the back of a horse that he borrowed from a carriage ride. Gandalf and his army do this in The Two Towers. Odin gets to pull this off in Thor. For extra cool, the horse in question has eight legs. As the prince of Prince Charming rides through the city he sees a woman being attacked. He jumps from his horse to go rescue her. Enchanted begins with Prince Edward riding up to save Giselle from a troll and they plan to get married the next day. In Ella Enchanted, one of the many times Prince Charmont saves Ella's life is from an ogre's boiling pot when he comes up on his horse. Many Zorro films feed this trope. Zorro's signature pose is raising his sword on top of a rearing horse. Done in The Lone Ranger, especially in the scene where the Lone Ranger and Silver appear on top of a building to lasso a gatling gun. In The Good, the Bad, the Weird, Do-won comes charging into the Ghost Market on horseback to save Man-gil from Chang-yi. He later charges into the middle of a Japanese cavalry troop. Gladiator opens with a Big Badass Battle Sequence in which General Maximus leads Roman cavalry into action against a Germanic tribe, even though Roman tactics were actually centered around their infantry. It does however enable to make our hero to look more badass than if he were leading the action from behind a shield wall. In his first gladiatorial combat in the Collesseum, Maximus ends up on a White Stallion taken from the charioteers he's fighting. An Invoked Trope in And Starring Pancho Villa as Himself. Villa is skeptical about Raoul Walsh, the American actor sent to portray him, and so the two men compete in showing off their horse-riding and shooting skills. Fortunately Walsh is good enough to satisfy Villa. During the train ambush, Thayer sets up his cameras under fire, points them back at the train and shouts "ACTION!" Cue Villa and his cavalry riding out of the rail cars straight into battle. The Magnificent Seven (2016): Chisolm and Faraday are fond of showing off their Improbable Aiming Skills while riding (such as accurately fanning a revolver from horseback), and make heroic charges at different points in the film. Hot Fuzz: When Sergeant Nicholas Angel returns to take on the conspiracy, he rides into the town square on horseback at a casual canter, wearing enough weaponry to outfit a platoon. In Sunset, Tom Mix and Wyatt Earp are flying to Mix's ranch to rescue Tom's girlfriend Nancy from gangsters when engine trouble forces their plane down. Discovering they are only 15 miles from Mix's ranch, they borrow horses from a couple of friendly cowboys, and come charging to the rescue on horseback. The Rohirrim, Gandalf on Shadowfax, and various other instances in The Lord of the Rings. A frequent occurrence for Zorro. Duncan fights for his life when his army is surrounded by Loris' troops and the main Mearan army, then casts a spell for a diversion while ordering Dhugal to leave and warn Kelson. Kelson and Morgan, riding with their forces, cast spells to save Duncan from arrows as he's being burned at the stake. Sandor Clegane's rescue of Sansa in the second book of A Song of Ice and Fire certainly qualifies, even though technically he's afoot at the outset. Still counts, though: he appears in the nick of time, prevents her from getting pulled off her horse and raped, swings up onto her horse in front of her, and gallops her to safety through a rioting mob. Another instance is his rescue of Arya when she suicidally tries to save her mother at the Red Wedding. This one's odd because he does show up a horse (as lightning illuminates the scene, even), and does ride up to her at a gallop while rain pours and thunder rolls...and then whacks her unconscious with the flat of an axe. (So that he can take her away from the unfolding slaughter.) Heroic! The deghans in the Farsala Trilogy clearly think they're this, and in the beginning they are - it's mentioned that Farsala is one of the few countries to have an effective cavalry. However, they are easily defeated by Hrum foot soldiers. 1632: Morris Roth, in the novella "The Wallenstein Gambit"note in the first Ring of Fire anthology, assumes the role in the defense of Prague from Holk's mercenaries, but not just with the traditional rearing horse and sword waving. As the defenders first gathered he did all that, but when Holk's goons showed up the next day, Roth, riding a horse borrowed from Pappenheim, simply kept his uptime rifle close to hand, ready to use. His coolly awaiting the arrival of the mercenaries served the purpose of calming his poorly trained troops far better than the sword waving routine. In the second Time Scout book, Skeeter uses his hard-earned horseback skills to win a duel in the Roman arena, then pole vault out and save a friend from slavery. Journey to Chaos: After Nolien mana mutates into a unicorn, Tiza rides into battle like a mounted knight. Referenced in Agents of S.H.I.E.L.D., where Fitz-Simmons tell Skye that the reason May is called "The Cavalry" is because she took out a hundred hostiles while riding a horse. Ward: The story gets bigger every year. Angel. Winifred Burkle becomes smitten with our hero after he rescues her from execution by demons, riding off with her on a horse "just like a fairy tale". The A-Team, "Showdown". The fake A-Team rig a van so it will drive down and hit one of Winnetka's tents. Hannibal, grabbing one of the horses from the show, catches up to the truck, jumps into its cab, and manages to stop it just in time to prevent it from hitting the tent and two people. The fifth episode of Burn Notice, "No Good Dead", features the Cool Car variant. Michael says, "When your back's against the wall and time is running out, there's nothing like seeing an old friend." Cue the Cool Car moment as the perfectly restored 1973 Dodge Charger (destroyed at the end of the last season) comes screeching into frame, driven by Fiona. Doctor Who: At the climax of "The Girl in the Fireplace", the Doctor jumps a horse through a mirror to save the day. Game of Thrones: Lyanna Stark is officially introduced galloping at the Winterfell grounds. This is a staple of The Lone Ranger, which showed such a sequence in its opening credits each episode. Person of Interest. In "A More Perfect Union", Root rides up on a black horse Just in Time to kneecap the two hitmen who are about to shoot John Reese and the Victim of the Week. She then puts the Damsel in Distress on the back of the horse and they ride off together. A staple on Queen of Swords. In the pilot episode of Roswell, Liz is accidentally shot when a fight breaks out at the diner she works at. Max, against his better judgement, uses his alien powers to heal Liz's wound before running out and driving away in an open-topped jeep. In the music video for Shania Twain's "That Don't Impress Me Much", one of the hunky gents she encounters while hitchhiking in the desert is something like an Arabian adventurer on the back of a charger. She waves him on, the ice princess. Modesty Blaise: When Sir Gerald's would-be assassin is fleeing on a motorbike in "The Killing Distance", Willie chases after him on a horse. And it's awesome. "A fiery horse with the speed of light, a cloud of dust and a hearty Hi-Yo Silver! The Lone Ranger! ... With his faithful Indian companion Tonto, the daring and resourceful masked rider of the plains led the fight for law and order in the early western United States! Nowhere in the pages of history can one find a greater champion of justice! Return with us now to those thrilling days of yesteryear! From out of the past come the thundering hoofbeats of the great horse Silver! The Lone Ranger rides again!" In Exalted, most characters with ability-based charmsets like the Solars and Sidereals can do this to one extent or another. The Solars invoke the trope the hardest though, particularly Hero Rides Away. The boxart of BIONICLE's special-edition Toa Lhikan & Kikanalo set depicts the hero Lhikan riding the rearing beast, despite the fact that in the story, he never shares a scene with any Kikanalo. 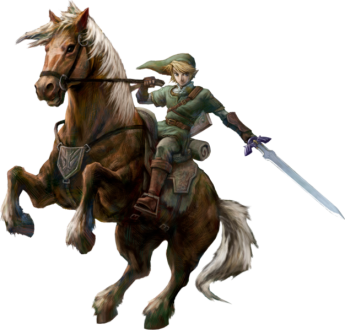 Link has been known for his horseback-riding skills since Ocarina of Time, but the first time full-fledged mounted combat was used in the series was in The Legend of Zelda: Twilight Princess, when you fight King Bulbin for the first time. The Legend of Zelda: Breath of the Wild: The second half of the Final Boss involves Link fighting Dark Beast Ganon on horseback, shooting at Ganon's weak points with the Bow of Light. In Super Robot Wars the Tatsumaki Zankantou (aka "Tornado Blade") Combination Attack has the Aussenseiter transform into a horse ridden by Dygenguar, who pull off this pose (with a BFS) before charging at the opponent. This is Odin's standard operating procedure in the Final Fantasy games: appear ominously out of the darkness while lightning flashes around him, raise his sword/spear, have his steed Sleipnir rear up on his hind legs and whinny, then charge the enemy with deadly intent. The Assassin's Creed games give you a button specifically for making your horse rear up. Pushing the 'jump' button while your horse is stationary in Red Dead Redemption also does so, and it triggers automatically when you successfully break in a wild horse. Similarly, in World of Warcraft, pressing the jump button while on a horse and stationary causes it to rear up like this, with similar results for most other ground mounts. Inverted in Warcraft III, before his FaceHeel Turn Arthas as a paladin is without a mount, after he becomes a death knight he is almost always seen riding his undead steed. In Kessen, your generals would always rear up their horses like this, along with uttering some sardonic/heroic line or another, after accepting an order to march or attack. Bartz of Final Fantasy V comes riding in on his charger to save Lenna, and then Lenna and Galuf. This being Final Fantasy, though, his charger is a chocobo. And the chocobo kind of had to talk Bartz into the second instance. In Paladins, you start each match, and return after each respawn, riding into battle on horseback to get to the battle faster. In Seven Kingdoms: The Princess Problem, two of the several possible results of the disastrous riding excursion in the second week has the Player Character saved from certain death by Hamin, or Hamin and Zarad together, riding to her rescue. In the "Hair-Raising Harness Race" episode of The Perils of Penelope Pitstop, Penelope and her horse rescue the Ant Hill Mob from falling down a deep chasm. In the Cartoon Network Groovies short El Kabong Rides Again, the title character rides in wielding a guitar to smite the villain.